HONG KONG (Reuters) - Thousands of Hong Kong pro-democracy activists forced the temporary closure of government headquarters on Monday after clashing with police, defying orders to retreat after more than two months of sustained protests in the Chinese-controlled city. Hong Kong leader Leung Chun-ying said police had been tolerant but would now take "resolute action", suggesting that patience may have finally run out. Speaking on a stage on Monday night in the heart of the Admiralty protest site next to government headquarters, student leader Joshua Wong said he and two others, including a secondary school student, would start a hunger strike to pressure Beijing to grant Hong Kong full democracy. "Today, we have decided to do this because we feel have no other road to take," said 18-year-old Wong, to loud applause and chants of support from hundreds of protesters gathered in the rain. He was speaking after chaos erupted as commuters made their way to work, with hundreds of protesters surrounding Admiralty Centre, which houses offices and retail outlets, in a stand-off with police. The central government offices and the legislature were forced to close in the morning, as were scores of shops. The latest flare-up, during which police charged protesters with batons and pepper spray, showed the frustration of protesters at Beijing's refusal to budge on electoral reforms and grant greater democracy to the former British colony. He did not respond when asked if police would clear the sites on Monday. "The plan was a failure on the whole, given that even if some places were occupied, they were cleared by the police immediately," Chow said. The democracy movement represents one of the biggest threats for China's Communist Party leadership since Beijing's 1989 crackdown on pro-democracy student protests in and around Tiananmen Square. Financial Secretary John Tsang said the protests had damaged Hong Kong's international image and hurt investor confidence, adding the city's economic growth could be lower than the government's forecast of 2.2 percent. The territory also reported a slowdown in monthly retail sales. Scores of volunteer medics attended to numerous injured, some of whom lay unconscious and others with blood streaming from head gashes. Police said at least 40 arrests were made. 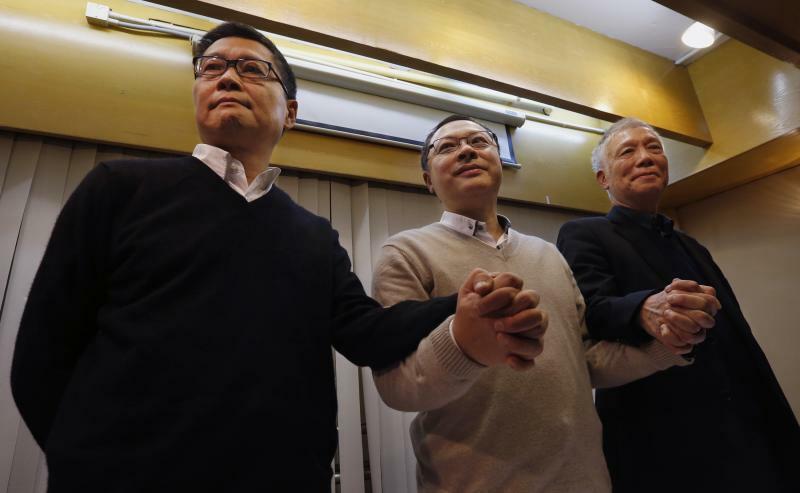 The unrest took place as British lawmakers said they had been told by the Chinese Embassy they would not be allowed to enter Hong Kong as part of an inquiry into Britain's relations with its former colony and progress toward democracy. Hong Kong returned to Chinese rule in 1997 under a "one country, two systems" formula that gave it some autonomy from the mainland and an undated promise of universal suffrage. The protesters are demanding free elections for the city's next leader in 2017 rather than the vote between screened candidates that Beijing has said it would allow. The Hong Kong rallies drew more than 100,000 on to the streets at their peak. Numbers have since dwindled and public support for the movement has waned.